I may be a bit of a Kantorei groupie. In fact, my college roommate is completely to blame. Her dad was a member of the Kantorei, so we listened to their CDs a lot while studying. We threw the Beatles and some country in for good measure, but it’s not quite the same. We may or may not have even had t-shirts. For those of you that have somehow managed to make it through life without hearing the Kantorei (how DO you do it? 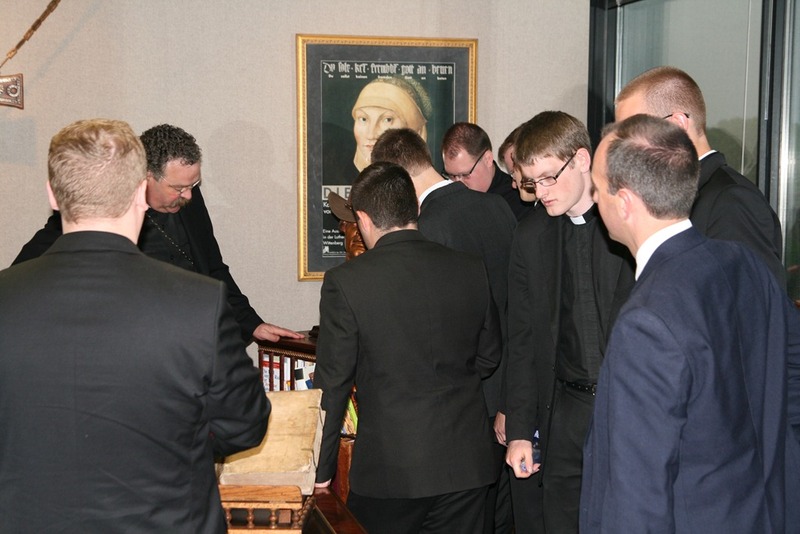 ), the group is a 16-member chorus of men studying for the Office of the Holy Ministry at Concordia Theological Seminary in Fort Wayne. 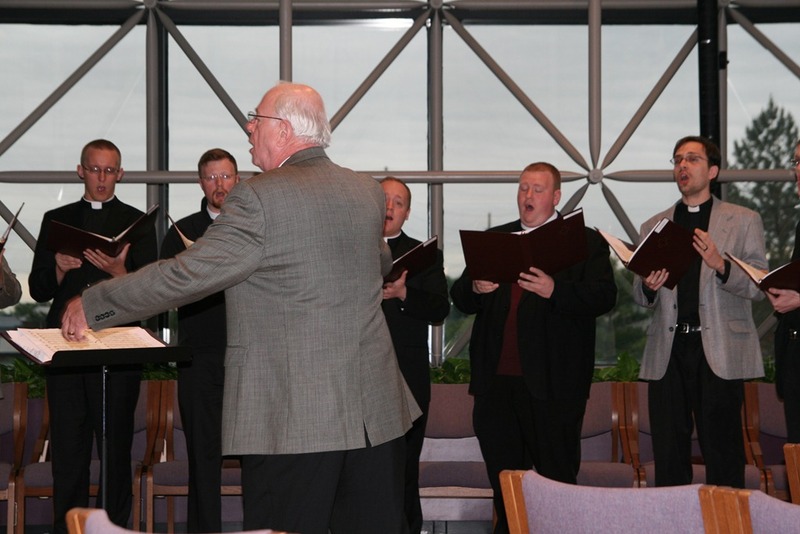 Last week, they stopped by the International Center to sing for chapel. You can watch their fabulous singing here. Afterwards, Dcs. Pam Nielsen showed them around the building. First stop: the president’s office. We practically had to drag them away from all his books. Come to think of it, if some are missing, I think we know just where to find them. Next up: the Walther Room, where lots of big, nifty meetings take place. 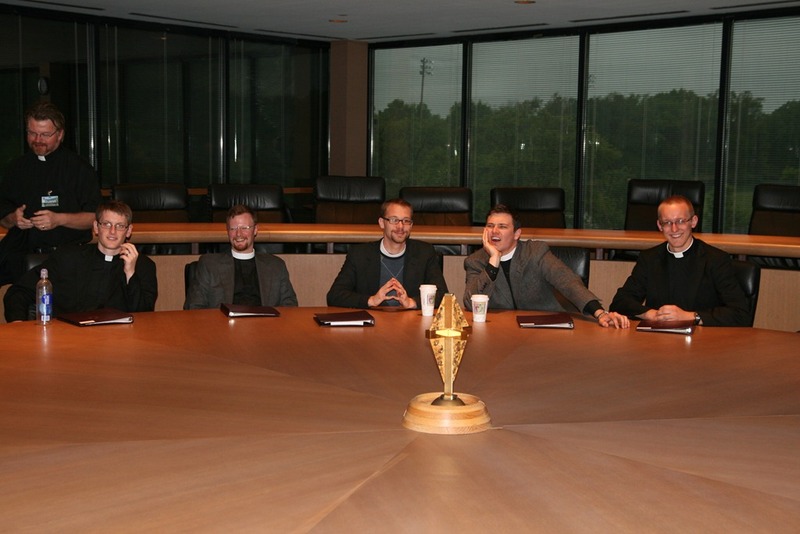 Is it just me, or do we have some future church leaders in the making? If you worry about the future of the LCMS, stop. These students may be young, but they are faithful. The Lord is working all their pastoral formation for good, and He is using the Church and her seminaries to do it. *And if, like me, you just can’t get enough of the Kantorei’s sound, check out this video from their stop by the cathedral in St. Louis. Glorious! Listen to many of the Kantorei’s selections that are a part of Lutheran Public Radio’s Sacred Music for the World at http://lutheranpublicradio.org/ thru Pentecost, May 27, 2012. Your old roommate sounds like a weirdo.